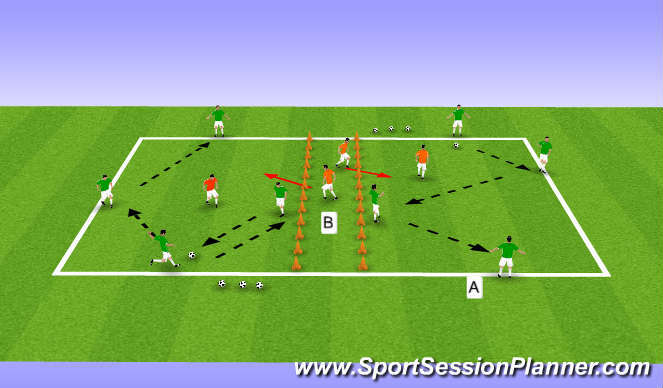 This practice focuses on a group of players retaining possession to move the ball from one end to the other. This involves team work and using the space available to support each other and to allow players to come up to think for themselves in a small area.The attackers try to transfer all the balls from one target player to the other and as quickly as possible. This creates a 2v1 scenario in the area initially and then later a 2v2. Each area has 2 targets players at each end, with 2 attackers with 1 defender. The target player has 4 balls (more if you want), they play the ball to the appropriate player who is in space to receive the ball and play directly to the other target player or look to pay to their team mate avoiding the defender. How many balls can the attackers get from one end to the other and in the quickest possible time? Â There are no restrictions on the play at this time. 1. Attackers may not play back to the serving target player. 3. Can attacker look to play one touch around the defender if it possible? 4. Now if you have more players these can be defenders (B) who can join from the chanell, to make a 2v2 in the area. When the target player has the ball they drop out and decide when to come in. This keeps the attackers alert looking for other defenders coming into play. Don't forget to rotate players!